When I was in China recently, my Beijing colleagues were raving about a TV series called A Bite of China (舌尖上的中国). It turns out that this show is causing quite a stir in China, and when I returned to the UK, I tracked it down on YouTube. As my Mandarin is distinctly ropey (OK, non existent), I was relieved to find some episodes had been subtitled, and so far I've watched the first two. They've both been brilliant, with production values and cinematography more reminiscent of a David Attenborough documentary as opposed to bog-standard food television. And the fact that there's no swaggering egotistical presenter (yes, I do mean you, Mr Ramsay, sorry, Chef Ramsay) means that this narrated show allows the food to take centre stage. The episode featured in this post is about staple foods, and there's some stunning footage showing how different kinds of bread, dumplings and noodles are made. But A Bite of China isn't just about the food; it's also about the stories of the people and the traditions behind the food. Guys like Mr Wang, who makes beautiful steamed yellow buns the old fashioned way, then cycles for an hour and a half from his home in rural Shanxi to the nearest city to sell them. Compared to some of the vacuous crap that passes for food programming on British television, this profound Chinese documentary is in a different class. Even if you don't understand a word of Mandarin and just watch the pictures, you will learn more about Chinese food in a single episode of A Bite of China than an entire series of Gok Cooks Chinese. A Bite of China deserves a wider audience, and wouldn't it be great if a British TV channel had the imagination to acquire this series and adapt it with an English narration? The neighbouring northern Chinese provinces of Shanxi (山西) and Shaanxi (陝西) are often confused with one another. Not only do they sound alike but their respective cuisines also share many similarities. In particular, both provinces are famous for their noodles, and to a lesser extent, their bread. I know that this is a bit of a generalisation, but as people in China can't access my blog (Blogger is banned) it's one I'm going to try and get away with! Beijing has many Shanxi restaurants, and I was taken to one called Datanghong (大唐红) where noodles are the main draw. Indeed, the noodle kitchen is on open view by the entrance of the restaurant. There are many different kinds of Shanxi noodles but arguably the most famous are honeycomb noodles (youmian kao laolao 莜面栲栳栳). 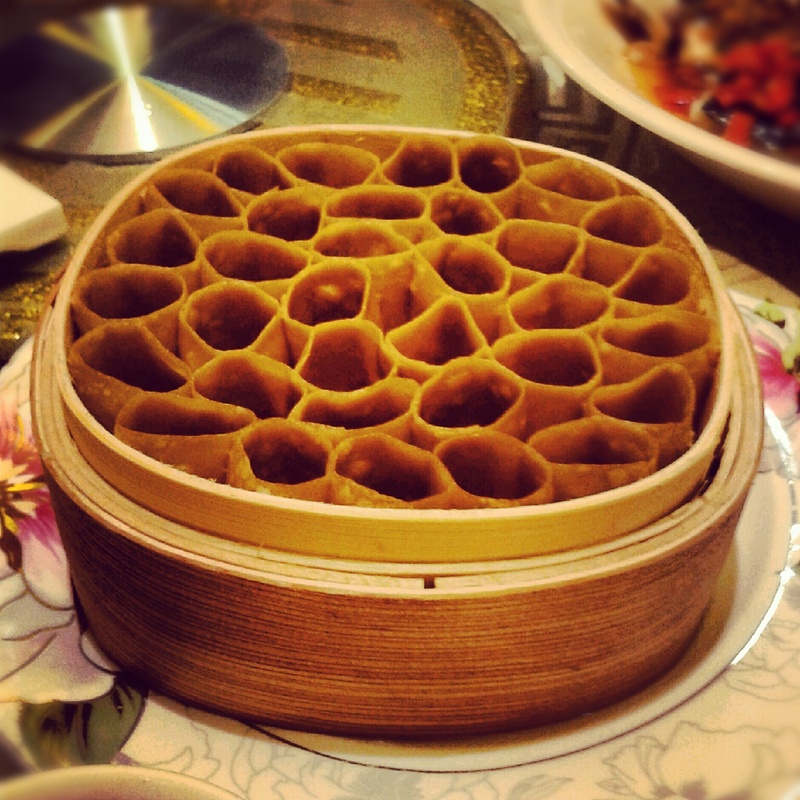 Made from a grain indigenous to the province called naked oat, these noodles are intricately arranged in a honeycomb-shape in a bamboo steamer before being cooked. Simply served with a chilli oil-vinegar dip, they were really addictive. As well as being eaten straight from the steamer, honeycomb noodles are also used in other dishes such as stir-fried honeycomb noodles with egg. Wok frying gave the noodles a slight char, and the texture, if not the flavour, was reminiscent of dry-fried ho fun noodles. It's a tough call to say whether these were better than the standard steamed version. Other noodles I tried included cat's ears (mao er duo 猫耳朵) and knife-cut noodles (dao xiao mian 刀削面). These were served with sauces on the side such as egg & tomato, which are then stirred into the noodles. I could've eaten these all day, but for the fact that there was loads of other dishes to check out. Just as impressive as the noodles were the sesame buns served with glass noodles, chillies and other bits and bobs. It was great fun making noodle sandwiches with the soft, spicy filling going really well with the buns that were slightly crispy on the outside. I would have liked to write more about this restaurant, but alas I was disorientated by jetlag and the unfamiliarity of the food when I ate there. That said, between my camera and Instagram, I can tell you that I enjoyed tucking into Shanxi-style crispy duck, roast mutton, mixed mushrooms in a mini-wok, and some psychedelic multi-coloured buns amongst other treats. I really enjoyed eating at Datanghong, and I hope this first experience of Shanxi cuisine won't be my last. Given the ubiquity of roujiamo (肉夹馍) in Beijing, one might assume that it's a local speciality, but in fact these sandwiches (sometimes nicknamed Chinese burgers) originate from Shaanxi province. The ones at Qin Tang Fu (秦唐府) were damn tasty with strands of moist, slowly braised pork seasoned with five-spice encased in a crispy unleavened bun. These were so popular that it seemed compulsory for every diner to order one. I think these would go down a storm in the UK. There's also a wide selection of noodles, and I chose a dish that went by the English name of noodles with garlic sauce. This name didn't really do justice to what was one of the best noodle dishes I've eaten in a long time. In one bowl came 'belt' noodles (think pappardelle, but even broader) in an intentionally bland soup with some greens. In a smaller bowl came a quite stunning spicy garlic sauce laced with sesame, bits of tomato, egg, wood-ear fungus and spring onion. To eat this dish properly, the noodles are transferred into the bowl of sauce, and given a good old mix to make sure that they are all coated. With hindsight, I shouldn't have supersized my noodles, but when it only cost the equivalent of 20p to go large, the temptation was too great. Be warned, the portions very are generous and filling at this restaurant, and I barely made any inroads into my order of stir-fried greens. I would love to revisit Qin Tang Fu, as there are loads of interesting Shaanxi dishes that I'd like to try. For more detailed reviews of this restaurant, please check out Rice & Pickle and Hungry Female (thanks for the tip, Shu). I've been busy lately, so I haven't quite got round to finishing the rest of my posts on Beijing. The thing is I have too many photos, too much to write to about, and not enough time. But they will see the light of day! 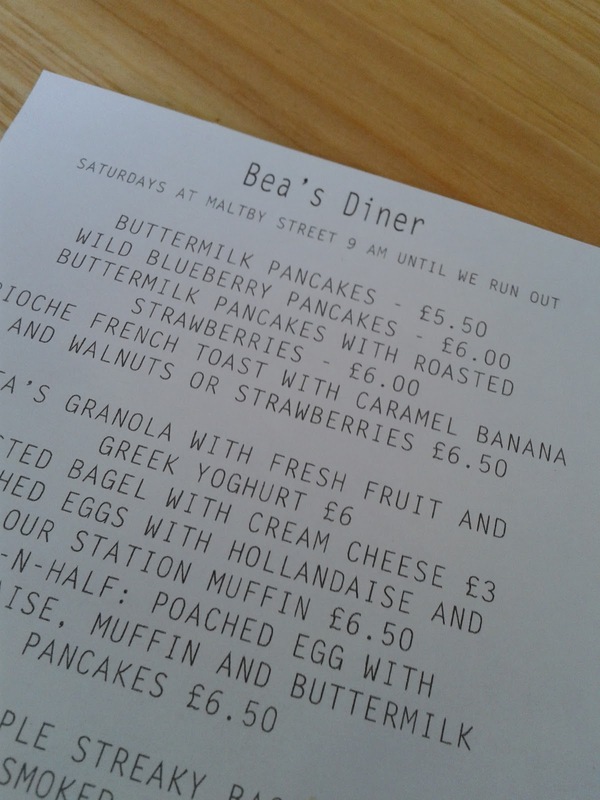 In the meantime, here's a quick post on Bea's Diner (an offshoot of Bea's of Bloomsbury) at Maltby St Market. 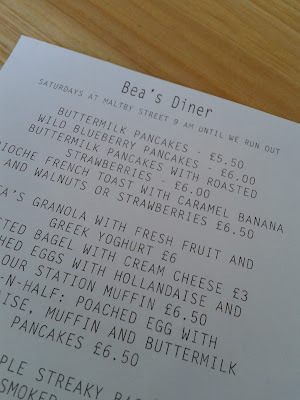 There's quite a bit of choice at Bea's, and I was torn between the buttermilk pancakes and the brioche French toast. In the end I decided to go with the latter, which came with caramel bananas and walnuts. Oh, and I decided to order a side of streaky bacon (it didn't seem right to have breakfast without bacon). While I wouldn't describe what arrived as being the most aesthetically pleasing plate of food I've ever eaten, I wasn't that bothered as long as it tasted good. It did. In particular, I loved the caramel bananas, which went really well with the French toast. The walnuts gave the dish crunch, and I was also surprised how well the salty bacon went with what was essentially a largely sweet concoction. The breakfast was also bloody good value, and I was proper stuffed. So much so, plans to eat my way round the market were shelved (perhaps this is part of an evil masterplan by Bea to take over Maltby St through the medium of breakfast). Anyway, it goes without saying that I'll be back. Next time, I think I might try the pancakes, or maybe the poached eggs and muffins. Banquet fatigue is not an affliction that I find too many people sympathetic to, but I think I've found the perfect cure: Yunnan cuisine. Yunnan is located in Southwest China, and is home to no less than 24 ethnic groups (comprising around a third of the population) in addition to the majority Han Chinese. Many of these ethnic groups can also be found in nearby Burma, Laos, Thailand and Vietnam. As such, the vibrant refreshing flavours found in Yunnan cuisine share many similarities to the food found in those countries. This makes it the ideal antidote to the sometimes-overwhelming hospitality that business visitors encounter in China. In particular, the vegetarian dishes at Dian Ku Yunnan Restaurant (滇酷云南餐厅) were amongst my favourites during this (or any) visit to Beijing. (That last sentence extolling the virtues of vegetarian food was one I NEVER expected to write as a food blogger!) Dishes like stir-fried eggs with jasmine (茉莉花炒鸡蛋) were a revelation. It was quite weird eating a dish of eggs and edible flowers with the intensely fragrant, slightly bitter tones normally associated with jasmine tea. This dish is heaven on earth and one that goes really well with bamboo tube sticky rice (竹筒饭). I also loved the Ruili pea congee (a terrible translation on the menu) that hails from the city of Ruili (瑞丽). This dish consists of wobbly blancmange-like strips (made from a kind of pea-flour) called doufen (豆粉). These strips didn't really taste of anything, but the accompanying spicy sesame oil dressing packed a punch while the herby-nutty topping gave the dish a contrast in textures. Other vegetarian fare that hit the spot included fried towel gourd buds (炒絲瓜尖). This is another inadequate translation that doesn't really describe a tasty dish consisting of the buds and leaves from a young loofah plant stir-fried with dried chillies, garlic and ginger. The only (slightly) disappointing dish was the Ruili green papaya (瑞丽青木瓜); this Yunnan version of the famous Thai salad som tum was refreshing, but sadly lacked any real fire. Lest you think I've gone completely veggie on you, we did order a couple of dishes with meat in them. First up was the air-pot chicken soup (气锅鸡), an amazing steamed chicken soup that came with abundant amounts of exotic mushrooms and goji berries. Like the rest of the meal, the flavours were ever so pure and natural. Less successful was the crossing the bridge noodles (过桥米线), which disappointingly came ready assembled rather than in the customary D-I-Y style where you build your own bowl of rice noodles. There was nothing wrong with this dish; it's just that it compared unfavourably with the food that came before. Although not strictly dessert, the meal was rounded off with pineapple sticky rice (菠萝饭). This was very moreish with the sweetness of the mixture of both black and white sticky rice cut through by the tartness of the pineapple. And while some quite potent black rice wine was on offer, we stuck to Yunnan’s other most famous drink: pu-erh tea (普洱茶) to accompany our meal. I really liked Dian Ku; not only was the food top-notch, but the dining room was pretty cool, too. I don't remember much about the service, which probably means it was decent enough. However, as I mentioned in the last post, Beijing isn't the easiest city to get around. With that in mind, if you can't easily get to Dian Ku then alternative Yunnan restaurants in Beijing include: Dali Courtyard, No Name, South Silk Road and Yunteng Shifu (please don't laugh at my review of the latter, it was written when I had blogger L-plates on). It wasn't until my fourth night in Beijing that I ate what could be considered local food. In other cities (like Hong Kong or Singapore) I would have stomped my foot like a spoilt six-year-old if I had to wait that long. But I don't mind waiting in Beijing because it's, with the possible exception of Shanghai, the only city in the world where one can sample food from every corner of China. For instance I ate Cantonese, Shanxi, Buddhist vegetarian, Xinjiang, Taiwanese, Sichuan, Shanghai and (more) Shanxi food before pitching up at Duwang 都王 for some local fare. Duwang specialises in the Chinese capital's most famous dish: Peking duck (Beijing kaoya 北京烤鸭). While the crispy skinned duck is the restaurant's headline act, the support acts are pretty damn good, too. Opening up this veritable festival of all things duck was a cold starter of mustard duck webs. These had been deboned leaving just the skin, web and cartilage. I really enjoyed the crunchy cartilage, with the mustard giving it a nasal passage-clearing quality. Next up was a rather theatrical dish of duck hearts served with a flaming teacup of baijiu 白酒. Here the hearts were skewered then placed in booze-fuelled flames. This may seem gimmicky, but the effect of crisping up the duck hearts enhances both the taste and texture. At around the same time out came a dish of duck liver, which was a bit like a pâté. This was OK, but to be honest, I can barely remember anything about it – never a good sign. Over the years I've pretty much eaten most parts of a duck, but the meat from the jaws was a new experience for me. Served in a vat of red oil infused by chillies and Sichuan peppercorns, these Sichuan-style duck jaws were revelatory. The meat on the jawbone was remarkably tender and had soaked up the numbing heat of the Sichuan peppercorns. What's more, the tongues were still intact – a bonus! Also bobbling alongside the jaws were lotus root, potato slices and mooli. These had also absorbed lots of flavour from the red oil. I was so engrossed in this dish that I missed out on taking photos of the chef carving up the Peking duck. By the time I'd finished my assault on the duck jaws, the Peking duck had already been carved up into slices of crispy skin and tender meat. As is the modern way, the crispiest bits of skin are set aside and dipped into sugar. The rest of the skin and meat are then used to fill pancakes or even better, sesame buns (zhima shaobing 芝麻烧饼), with the usual spring onion, cucumber and sweet bean sauce. The duck was very good at Duwang, and the meat was kept moist and tender by being served on plates over a tealight. You can opt to reserve some of the duck meat for a stir-fry, but we eschewed that option, as the restaurant usually diddles you by not using all of the meat. Instead the carcass is usually bagged up and taken home to make stock. However, in this instance it was used to make an extra course of deep-fried duck bones tossed in garlic chilli salt. This was a fine accompaniment to my beer and I enjoyed hoovering up the last remnants of meat off the bone! There was also one last course of duck soup, but this was a bit bland. There were also some non-duck dishes such as cucumber salad, stir-fried greens and other bits and bobs, but I can't remember much about them. Besides, who cares? Restaurants like Duwang stand or fall by the quality of their duck dishes. There's a lot to like about Duwang: the good service, the traditional 'red and gold' décor, but above all, the pride in the food it knocks out. The thing is, though, Beijing (being a city of 20 million inhabitants) isn't easy to get around, and a restaurant has to be really exceptional to schlep across town for. Duwang just falls short of falling into that category, and I consider it to be an excellent neighbourhood joint rather than a must-visit. Mind you, it is close to the Olympic complex, which remains a popular tourist attraction. The easiest way to get to Duwang is to hail a taxi, and show the address to the driver. As the restaurant doesn't have English signage, look out for the characters 都王 on the shopfront. For a similar old school duck-focussed feast to Duwang, I recommend Ya Wang (鸭王), which has branches dotted across the capital. I've probably been to this restaurant more than any other in Beijing, although my last visit was way back in 2009. 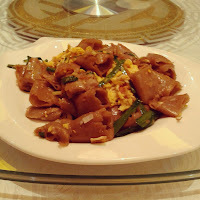 More recently, fellow blogger Hungry Female enjoyed Liqun, a charming, if slightly run-down, joint in a Beijing hutong. For an upmarket Peking duck experience, the consensus choice seems to be Da Dong (大董). Here the focus is as much on modern Chinese cuisine as the duck. I was blown away when I ate there in 2010. Other posh places that people rate include Duck de Chine and Made in China. One last word of advice, lots of guidebooks and websites still mention Quanjude 全聚德 as a place to try Peking duck. However, many are of the opinion that this famous restaurant group is trading on past glories, and my colleagues in Beijing consider it to be a tourist trap. Dim sum has been around in the UK for many years, but it was largely the preserve of the Chinese community for a long time. However, in the last decade or so, it has crashed into the mainstream. One of the side effects of its popularisation has seen this hitherto daytime treat served in the evenings with cocktails. Unsurprisingly, this jars with traditionalists such as myself, but I've just about got over this shocking breach of etiquette! While there is no reason why an all-day dim sum cocktail bar shouldn't work, it doesn't help that the food served by this concept's chief exponent, Ping Pong, is so poor. With that in mind, one might suspect that I wouldn't be tempted by Courtesan Dim Sum Bar, but this Brixton newcomer has enough old school touches (namely a bilingual Chinese-English menu including cheung fun) for me to give it a try. Kicking off with the steamed selection, the king prawn dumplings (har gau 虾饺) were above par with well-seasoned prawns and a delicate wrapper. Less successful were the chicken & coriander dumplings (香菜鸡饺), as I'm not a big fan of minced chicken - it just isn't fatty or juicy enough. The steamed roast pork buns (cha siu bao 叉烧包) and chicken buns (gai bao 鸡包 ) were nice and fluffy although stingily filled. Onto the non-steamed offerings, and I was really impressed by the taro croquette (wu gok 芋角) as it was crispy, not oily with a tasty filling. I also liked the roast pork puff (cha siu sou 叉烧酥), but was less enamoured by the roast duck puff (siu aap sou 烧鸭酥). The latter was just too aggressively peppery for my liking, and I could barely discern that the meat was indeed duck. prawn with beancurd cheung fun (鲜腐皮肠粉) where mashed prawn is wrapped in tofu skin, deep fried then carefully wrapped with rice noodle sheet. This triple-textural delight of springy mashed prawn, crispy tofu skin and slippery smooth cheung fun was a revelation. The roast pork cheung fun (叉烧肠粉) was also very good, too. I'd even go so far to say that Courtesan's cheung fun is right up there with London's finest. Whilst the cheung fun was exemplary, there were some duff dishes, which regrettably included some of the house specials. I just didn't get the idea behind the jerk chicken parcel in rice. The rice wasn't moist enough, and surely jerk chicken isn't at its best when steamed in a lotus leaf. And the seasoning didn't help either, as it was very one-dimensional in its spiciness. In common with the steamed buns, the sesame grilled vegetable & meat buns (煎菜肉包), while technically spot-on, were inadequately filled. Rightly or wrongly, when the label Sichuan/Szechuan is attached to a dish, one expects fireworks. So it was a bit sad that the Szechuan-style ribs (川式排骨) were so insipid. To me, they were bog-standard fried spare ribs, but without the familiar Cantonese chilli-salt (chiu yim 椒盐) seasoning. There wasn't much room for dessert, but we managed to squeeze in some black sesame balls (雷沙汤丸), which were of a decent standard. As well as cocktails, Courtesan has a very good tea selection, and a dim sum meal with tea would set you back around £20/head. On balance, I like Courtesan. The classics such as har gau, wu gok and cheung fun (especially the latter) were of a high quality. There were some misfires, but there is undoubted skill in the kitchen. Service was good, but then again we were only the diners the other Saturday (I can only put this down to the fact that the restaurant was newly opened in late-April, and had only been in business for three weeks when we visited). And given the largely empty dining room, I couldn't really judge the ambience. For that I guess you need to visit on a busy night. So where does Courtesan sit in the London dim sum scene? For me, it's a good local rather than a destination for dim sum. In my opinion, there a couple of factors holding this restaurant back from greatness. Firstly, the menu is too brief, and while this isn't necessarily a bad thing; there are some notable dim sum absentees such as fried cuttlefish cakes (mak yu beng 墨魚餅). And the total lack of non-dim sum dishes such as Cantonese BBQ and noodles restrict opportunities to bulk out the meal. Secondly, it isn't particularly cheap with prices from £3.20 upwards, which is on a par with swankier restaurants such as Princess Garden and Phoenix Palace, both highly regarded dim sum destinations. Then there's the wider competition within Brixton itself, where there are loads of affordable, decent quality dining options. I fear I may be being too hard on Courtesan; I don't mean to, it's just that I'm very particular when it comes to dim sum. And for all my (minor) gripes, I'm glad that this restaurant is spreading the gospel of dim sum to Brixton. So if you do find yourself in the neighbourhood, do check this place out.